When I first saw Nanda Devi, barely visible beyond a jagged ridge, I didn’t know any of its history. But in an area where every peak and valley seemed to hold so many stories, the sight left me with questions and a strong sense of curiosity. 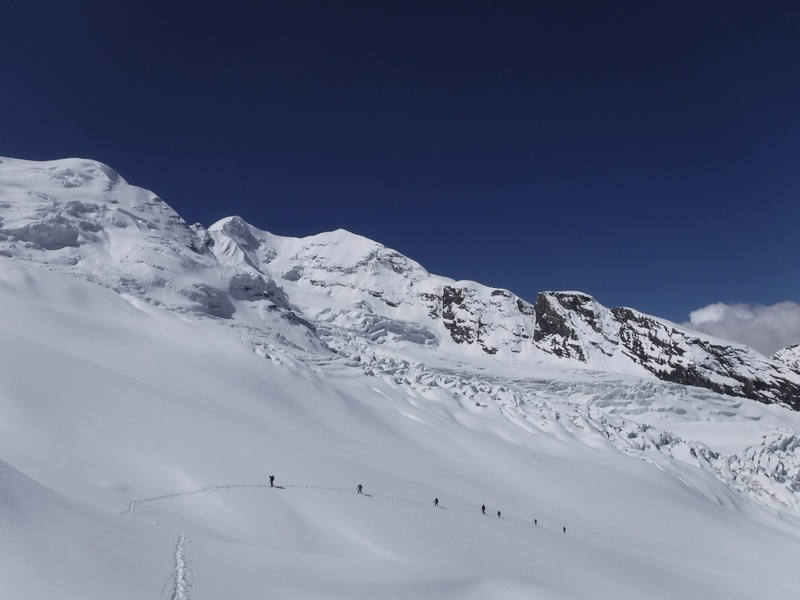 I saw Nanda Devi on a NOLS Himalaya Mountaineering course—six weeks among the world's tallest mountains with eight fellow students and three instructors. 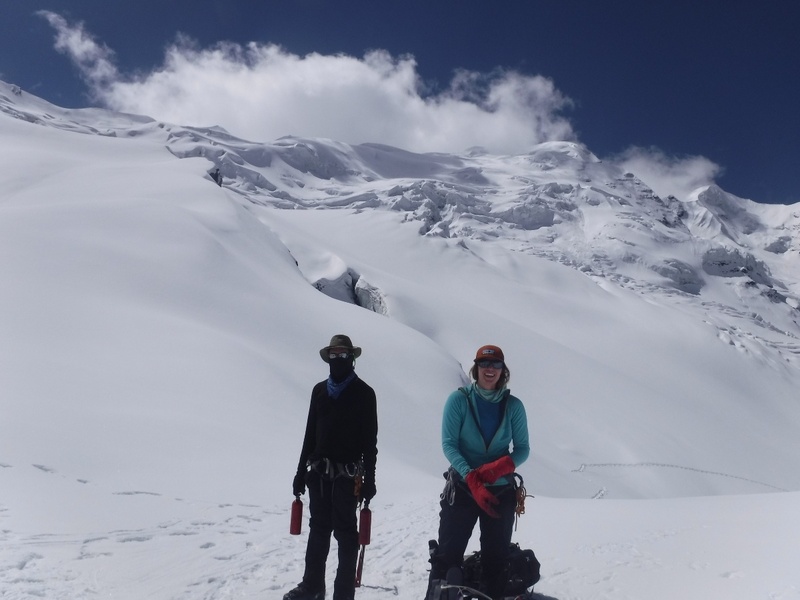 Our goals were to develop alpine climbing skills and learn about local culture—religion, food, lifestyle—as well as complete a challenging traverse of the mountains. 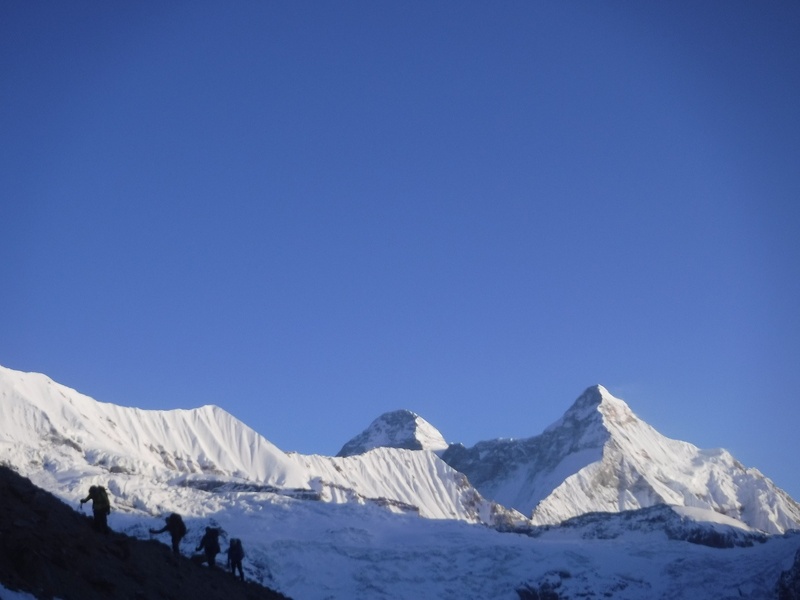 We began by trekking up the rugged Pindari Valley, moving slowly to ease the acclimatization process. Each day climbing higher, we began to see rock replaced by ice, rain by snow. One afternoon as we went about setting up camp, one of our instructors made a comment that really interested me. 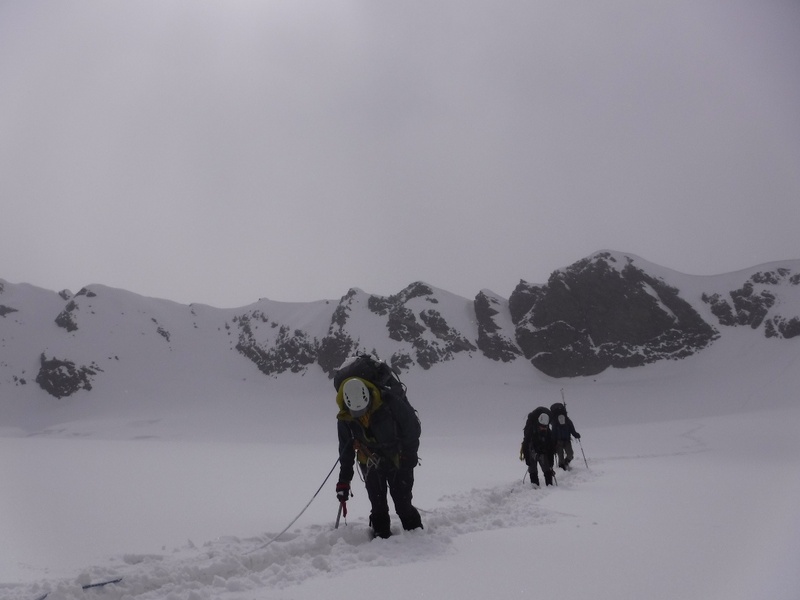 A rope team traveling through deep, heavy snow on a particularly difficult day on the Kafni Glacier. Photo by Chris Pouch. Nanda Devi is known as the highest peak in the Uttarakhand Himalaya, standing at 7,816 meters (25,643 feet). Closed to climbers since 1988 when it was established as a national park, the view can only be taken in from a distance. I appreciated my instructor's message—a call to practice the art of dancing in the rain. Inspired, I decided I would do it. We were used to waking up in the shadow of the large peaks that surrounded us. 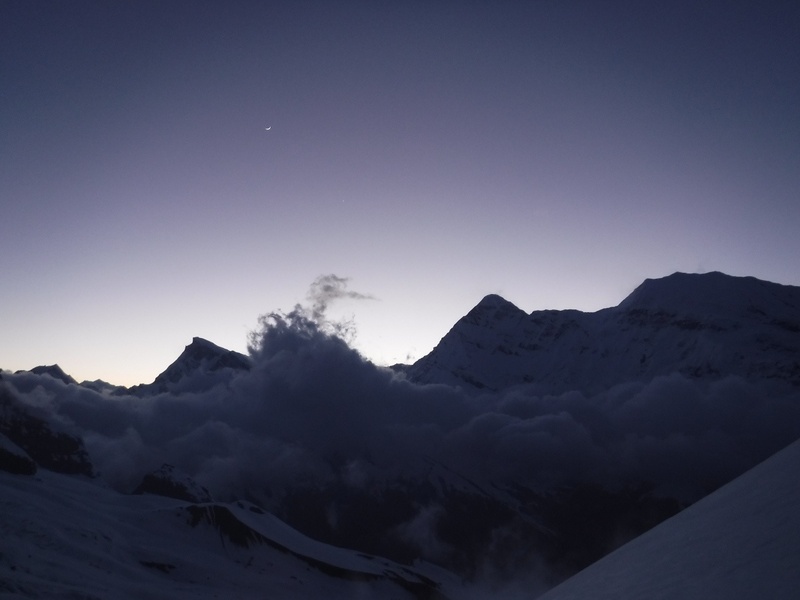 While Nanda Devi collected first light at 5 a.m., it wasn’t until two hours later that our camp was warmed by the sun. The days, thanks to the reflective snow, were bright and hot, but mornings were long, dark, and cold. The next morning, when my watch alarm started beeping quietly at 4:30 a.m., I knew the hardest part had arrived. 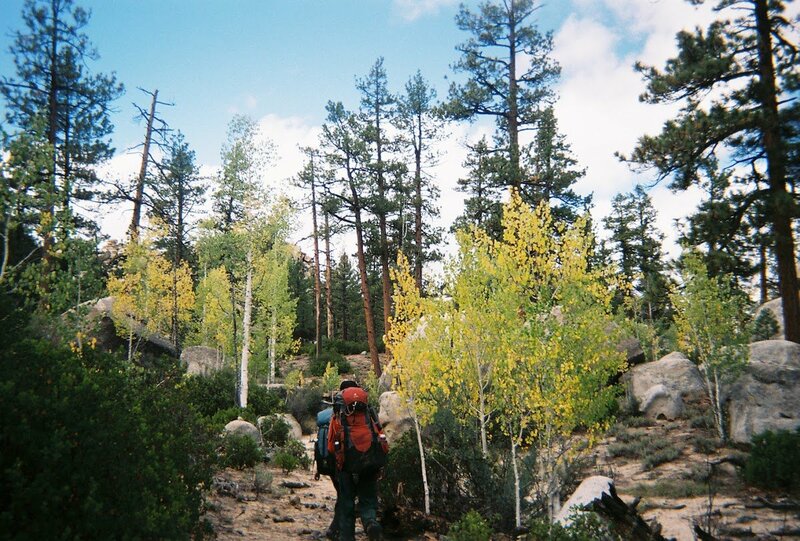 Once layered in warm clothes, the stunning cold outside the tent would be manageable, but the long process of leaving my sleeping bag and letting its warmth drain away left me with curled toes and fumbling fingers. Knowing that I could go peacefully back to sleep for another two hours made things worse—but I knew the sunrise wouldn’t wait. I unzipped the tent and the fresh night air whooshed in, quickly waking my tired eyes. It was still dark—I had time to make tea before settling onto a comfortable rock. Warm steam swirling from my cup, I watched the sky get lighter and turn milky white as the stars gradually went away. Night falls over the Pindari Valley as low hanging clouds swirl in the wind. Photo by Chris Pouch. Suddenly, the first golden sunlight landed on the very top of the mountain in the distance, turning it to the color of a city at night. It was surprising how fast the light descended, drenching more and more of the rocky mass until the smaller peaks around were also lit, night-time slipping away into the new morning. The transition lasted only a few minutes as the pale horizon became a soft, subtle blue. The pinks and oranges of bookstore postcards were no more than hints in the brightening sky. I stayed on the rock for a long time, watching the shadows of the snowfield and faraway rock faces wander and shift, fading as they were flooded with light. The scale of the place was paralyzing, and the emptiness haunting. A sharp breeze brought flurries of loose snow off the ground, shifting and letting them settle again into frozen ripples. I wondered how such a stunning place could seem so forgotten, and how the view I was taking in would likely go unseen for months at a time every winter. The idea seemed strange, but I suppose the remoteness and solitude were part of what made the place special. I enjoyed the peace and quiet of that morning. It gave me the chance to reflect on all the learning and preparation that had gone into the previous weeks. Each day had been brimming with effort, and each night sleep had come easily. But instead of feeling tired from the early morning, I felt ready for everything ahead. As the first direct sunlight touched the edge of camp, I stood up and began the day with a renewed sense of appreciation. 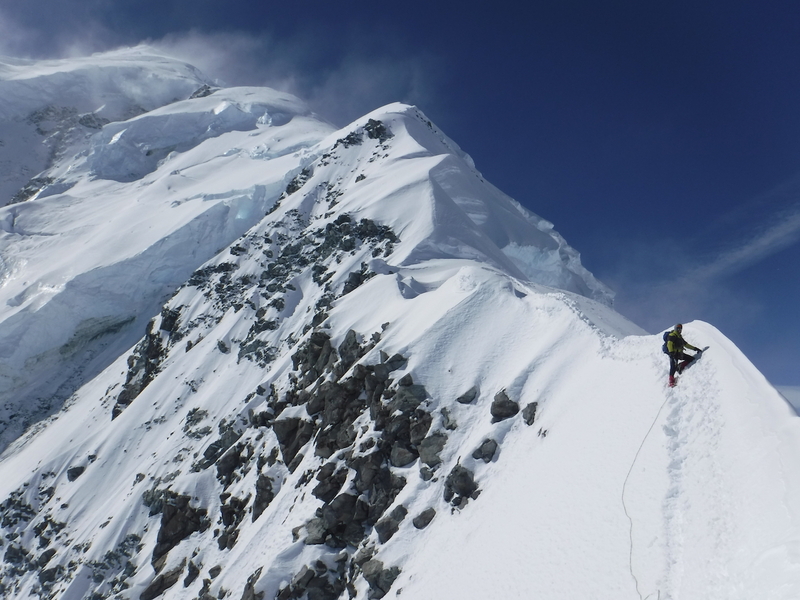 Expedition members taking advantage of a weather window, attempting to reach Kafni Col, a high pass above Camp 2. Photo by Chris Pouch. On an expedition, it can be hard to find alone time. Everything is about the team, about working together. Because of this togetherness, the solitary moments are more meaningful. Thinking back to my instructor’s comment, I decided it must have been meant as more than a suggestion to watch a sunrise. He was reminding us to find these kinds of moments every day, no matter where, even at the expense of a bit more effort. He was telling us the effort would be worth it. I’m back at home now, sleeping in a normal bed with several blankets. I’m studying in college, working part-time, and trying to stay in touch with friends who are doing the same. It’s wonderful being home again—two minutes is enough time to make tea here, and I haven’t had cold toes in months—but I’ve also been sure to honor what I learned on the expedition. By taking some time, every once in a while, to sit down and enjoy the simple views that surround me—my dog scouring the shallows of a pond for fish, or the first red leaves of fall—I’ve been able to find the same meaning in places that are much less far afield. 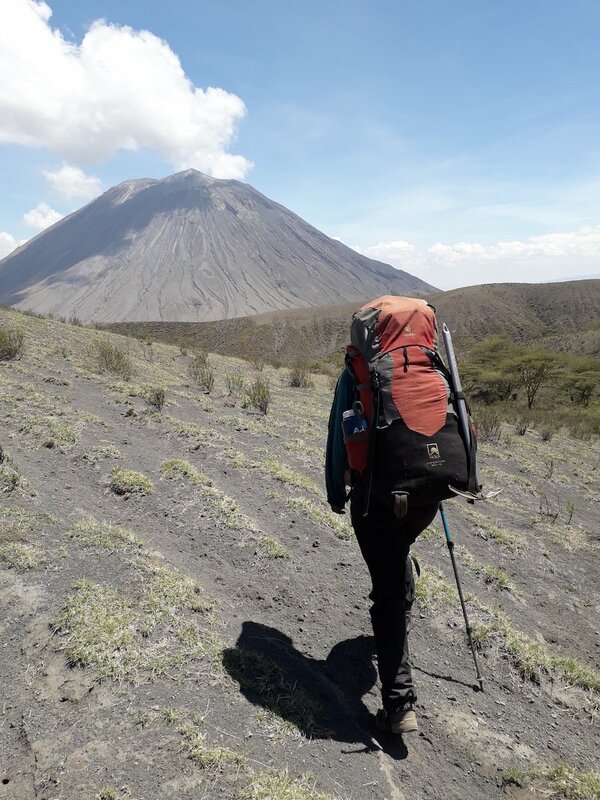 Make NOLS a part of your study abroad plans. Two of my coursemates, Kurt Mueller (left) and Carey Faber (right), enjoying a moment to relax after an excellent morning ascent. Photo by Chris Pouch.